Originally a CD only available from Grouch himself at shows, this album compiles unreleased cuts from the Making Perfect Sense era. However, don't mistake this album for just a bunch of 'scraps' thrown together on a CD. This flows just like a regular album and unlike a lot of releases out there, this contains no filler! 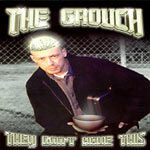 All Tracks produced by The Grouch except track 2 by Nebulus, 3 by DJ EQ and track 15 produced by The CUF.